Yuexiu Park is combination of hills, lakes, museums, amusement parks and historical sites and hence, it together proves to be a lush green area also offering other facilities. 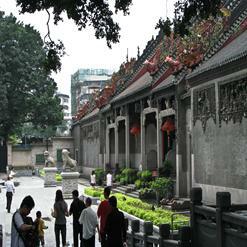 The park is named after Yuexiu Mountain and was built in 1952. It acts as the biggest comprehensive sightseeing park in Guangzhou. Covering an area of 860,000 square meters, the Five-Ram Sculpture is one of the most famous structures in entire city of Guangzhou.